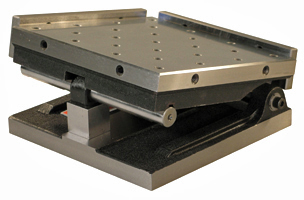 MASTER-SINE SINE PLATES by Suburban Tool, Inc.
Master-Sine™ sine plates provide a sturdy and accurate way to grind or measure angles. B-3-SP and B-5-SP have 1/4-20 tapped holes. The remaining models have 5/16-18. The roll bar is made from hardened steel, ground and lapped for straightness and roundness. 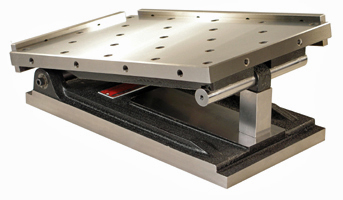 Swivel block provides full face contact with gage blocks, keeping them securely in place. Exclusive locking device inside the hinge roll provides a positive lock with an expanding action. Both screws lock toward the front of the unit, pulling the top plate down on the set-up gage blocks without distortion. Hinge is made from hardened steel, ground and lapped. Angular accuracy of set-ups is guaranteed to be within 5 seconds of arc up to 15°, 10 seconds up to 30° and 15 seconds up to 45°. Side and back rail included.